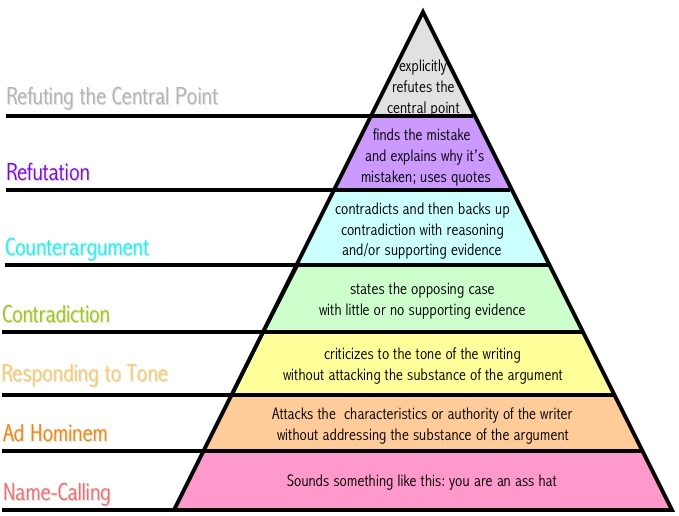 I am hoping that our country can move forward and find a way to disagree without being disagreeable.. but I don't see much evidence of it.. both sides are calling folks liars and seem comfortable operating on the bottom level of the triangle. There are at least 6 different parties participating in the Health Care Reform debate. (1) The politicians who support the Obama proposal. (2) The politicians who oppose the Obama proposal. (3) The pundits who support the Obama proposal. (4) The pundits who oppose the Obama proposal. (5) The citizens who support the Obama proposal. (6) The citizens who oppose the Obama proposal. For the most part, the politicians have avoided name calling. Exageration and lying, however, is fundamental. The rest of the debaters will never agree or compromise. They are calling each other names, exaggerating and lying. However, these debaters influence the outcome of the legislative process. The pundits use exaggeration and lies to influence the citizens. The politicians, many who face re-election next year, have to satisfy their political parties and their commitments to the lobbyists that contribute to their campaign financing, while appearing to their constituents that they are representing their best interests when they are only trying to get their votes. This is no simple matter.